There is a really terrible, really old joke about an argument that takes place in Heaven between the forces of Light and the forces of Darkness about who is the better computer programmer, Jesus or the Devil. Finally tired of all the bickering, God decides to put an end to the argument and sets up a test. Jesus at one computer terminal, the Devil at another computer terminal, a single problem they both have to solve… and a time limit. Ding! The bell goes off and both begin furiously pecking at their keyboards. A few minutes later, just to make things interesting, there’s a crash of thunder! But both programmers are focusing on the problem and neither is distracted. A few minutes after that, there’s a flash of lightning! But even that can’t distract the programmers from their task. And a few minute later, with only a little bit of time left on the timer, the power goes out. Both computer hard drives spin down to a stop. Both computer monitors go black. The air around the Devil’s terminal grows positively sulphurous. Even Jesus looks a little startled. But then the power comes back on and both of them return to the task, furiously pecking away at their keyboards. The Devil can’t believe it. Nobody, but nobody, could have finished that problem in the time that was left when the power came back on, not after losing everything when the power went out. You wouldn’t have wanted to hear what the forces of Darkness were saying that turned the air even more sulphurous. And what were the forces of Light saying? So what does that really terrible, really old joke have to do with genealogy? Think about all the things you’ve acquired or done in your genealogical research that exist only in the form of a computer file. Think about all the photographs you took of original documents at that repository you went to last week. Think about the birth and death certificates you bought at no small cost to your pocketbook that were sent to you as digital files by some vital registrar’s office. Think about the pension file the National Archives sent out as a PDF file. Think about that proof argument you researched and wrote and rewrote and rewrote again and again and finally saved as a word processing file. If your power went out… if your hard drive crashed… how sulphurous would the air be around your computer terminal? I raise the question now because you wouldn’t have wanted to hear what was being said around my computer terminal last night after an iPad operating system update required the entry of a passcode that I had never set in the first place, locking me out of access to some documents I really really needed to finish a project with a due date of — you guessed it — 1 December. It wouldn’t have been an issue on my desktop or laptop. I have multiple backup systems in place on my computers. Automatic offsite backups. 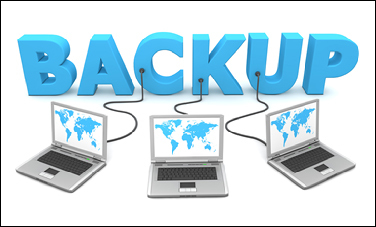 Periodic onsite backups to external hard drives, and periodic onsite backups to other external hard drives kept offsite. Belt, suspenders, then belt on the suspenders. Now the story turns out to have a happy ending. Thanks to a combination of an older backup on iTunes, current photos in iCloud, and some technical advice from computer gurus in the Technology for Genealogy group on Facebook, everything I needed was recovered and the iPad is now humming along nicely with the new operating system installed and everything once again fully backed up. And I have a new system in place for automatic backups of everything on the iPad too. But for a few minutes last night that air was positively sulphurous. I don’t know about other continents, but here in Canada and the United States, many (most?) of us have high-speed internet and something that resembles a computer network at home. A “Network Attached Storage” (NAS) unit is inexpensive and worth its weight in gold. With some free software and scheduling my data is backed up automatically, daily, to a device with redundant hard drives. My D-Link DNS-323 has mirrored drives: meaning if one drive fails my data is still there and gives me a chance to replace a drive and keep going without losing anything. Add to that, the same device is a “cloud” device that lets me access files at home when I am on the road. This device, with drives, cost me less than $300. What is my data worth? Much, MUCH, more. Don’t want to buy another box? There’s lots of online solutions as well, and a few genealogy tech gurus who have blogged about it. Preach on, brother Tim! I use both home AND cloud backups for redundancy. I just hadn’t set it up as well as I could have for the iPad… but I have now! Worked in IT for 33 years. Over those years Presidents, CEO’s, Managers right on down to the little person working in the cube, no one was immune from data loss. I have seen top level management screaming they would fire everyone in IT, the little person in their cube crying “I can’t do my job” but still “data loss” marches on. The old saying in IT “that you can not have enough backup” still rings true today. So, in the final analysis it will and can happen to anyone. When it does and there is no possibility of recovery, “Just Smile, Bite your Lip and curse quitely”. All we can do is try to limit the damage, Stan — and I’ve got things set up to do as much damage limiting as I can now, even on the iPad! Judy, you never cease to tickle my funny bone! Great joke and even better advise! Thank you.